I recently saw photographs by others of this scene and was reminded, to my surprise, that this was all of ten years ago, in February 2008. This is a shot I took at that time. I just happened to be visiting the area, travelling north to see friends and relatives, and happened to see this extraordinary sight on the beach at Cleveleys, near Blackpool. The photograph does not give much of a sense of scale – the available angles for a shot were limited, not least due to security guards on the beach stopping the public getting near. Being present was a rather different experience from viewing the vessel contained comfortably within the photographic frame. It is quite a strange spectacle to see something as large and majestic as a ship flipped onto its side, helpless and being pushed around by the tides on a tourist beach. Also, this was shot on a compact camera – not something I would use for my professional photography, but all I had on me at the time. Nevertheless, I still think the photograph catches something of the surreal quality of the scene. This is, or was, the MS Riverdance – a ferry operating Irish Sea routes. It was ‘broadsided’ – hit by a large wave at the side – which caused its cargo to shift. The consequence being that it was pushed over to an angle of 60 degrees, lost the use of its engines and was out of control. 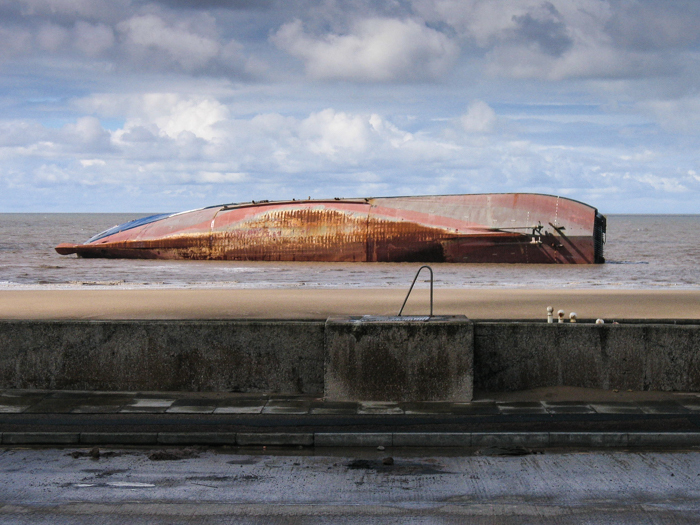 With the crew airlifted off, the ship drifted towards Cleveleys beach, where it was grounded. It was eventually cut up and salvaged on site. Nothing remains there now. Stephen Riley - Commercial and Editorial Photographer, Somerset.